a focal point in the capital. Sadly this monument if often overlooked and forgotten, as it is located at the end of a residential street in Plymouth, Massachusetts standing on a little hill amongst homes. The statue points towards the sky giving power and glory to God. Perhaps that might be a contributing factor as to why this majestic piece of history is neglected by our country, and a primary reason we should focus on this monument now more than ever to explore and restore what this statue represents. Unfolding the richness of what this monument symbolizes would take a lot more time and attention than I can relate in this article, it wouldn’t do justice to this masterful artwork. The monument is comprised of several statues which outline the five (5) keys of knowledge that tell the story of what our nation’s pilgrims believed in and on which our country was founded. In order to get the most out of this monument there is an order or sequence to the keys. Standing at the center of this monument is a beautiful woman who represents Faith. She stands with one foot on Plymouth Rock, has an open Bible in her left hand that is well worn from reading while her right hand is uplifted to heaven. There is a star on her forehead which means she was given wisdom to live in this world. She looks down as if to call people to trust in a higher power. Faith is at the center and is the tallest point on the monument there are four other statues that are beneath and circle Faith. Those statues are Morality, Law, Education and Liberty. Morality is depicted as a woman which unseeing eyes, meaning that we are to look inward and are responsible for our own morality. She is wearing a breastplate necklace which represents that the individual followers of Christ have direct access to God and is a priest to his family. In her left hand are the 10 Commandments which represents God’s direction for life and in her other hand is the Scroll of Revelation which states God is the Alpha and Omega and rules over all time. On the base of Morality there are two more statuettes one that represents a prophet that hears the call from God and follows God’s commands the other is the Evangelist which is taking seed from the Bible and sowing it; which is a common allegory for preaching the message of Christ. The pilgrims’ desire was to live in their faith, be an example and share their faith with others. The statue representing Law is a very stern faced man with serious eyes that have vision. In his left hand are the 10 Commandments – 6 of these deals with civil society. *Honor your father and mother *Do not murder *Do not commit adultery *Do not steal *Do not covet *Do not bear false testimony. His right hand is extended in mercy. The pilgrims believed that all were created equal before the law that no special privileges should be considered due to birth, wealth or social status. Many of their laws came right from the Bible and applied Biblical principles to justice, ethics and proper restitution for wrong doings. Beneath the statue of Law are two more statuettes representing Justice and Mercy. Justice has scales in her right hand which represents equal justice under the law for all, no matter their standing in society, and that the punishment should fit the crime. There is a sword by her left side which represents that authority is given by God to the civil government to provide justice. Mercy is a man standing with both arms at his side with his hands palms open and lifted up depicting balance and any punishment will be fair. The Law’s pedestal is a replica of The Peace Treaty. Education is represented by a youthful woman who is wearing a “victor’s wreath”, showing she had accomplished the task of educating her children and was victorious in passing on the ideals of liberty to the next generation. Her youthful face shows she completed this task at a young age. She has an open Bible on her lap with a finger on the page as if giving instructions, it also represents all books that speak of whatever is true, whatever is noble, whatever is right, whatever is pure, whatever is lovely, whatever is admirable, to focus on those things that are excellent and trustworthy. Learning was highly valued among the pilgrims. The two statuettes below her showing youth and age depict a woman holding a child’s hand which relates that teaching a child is hard work and she is holding his hand which shows love, leading him in instruction and guiding the child. Literacy was high among youth and adults. Reading the Bible and other books were the key to learning and education. Literacy rates and breath of reading far outpace today’s standards. The other statuette is an older man depicting a wise counsel of elders and at his feet are 3 objects. An open Bible representing a lamp unto our feet and a guide to us, behind the Bible are the 10 Commandments God’s guidance for personal behavior and the basis for civil government and then the glob taking the Great Commission to the world. The Education’s pedestal has an engraved replica of the Mayflower Compact. The Mayflower Compact is representative of the 4 forms of government. Individual government, which is self responsibility and self governance, next is Family government which represents love, care, provision, children, education and legacy. Then comes Church government which provides inspiration, encouragement and accountability with the last form of government being Civil government which is protection and justice. As you apply those characters to yourself, the individual, those same qualities should be made manifest in civil government, electing persons of no special eminence above the rest, let your wisdom and godliness appear. Select capable men who fear God, trustworthy men, who hate dishonest gain. Ex 18:21 (NIV). (Standards we have lost along the way, however they can be restored). The final statue is Liberty which is represented by a man in his prime sitting down with a steady gaze which shows clear sight, there is a rising sun on his helmet which denotes a new day of liberty dawning. There is a slain lion with a paw on his right shoulder, his left arm shows lion skin and a foot while behind his back is the lion’s head. The slain lion represents spiritual tyranny which the pilgrims believed that they were overcoming l Peter 5:8-11 (NIV) “Be self-controlled and alert. Your enemy the devil prowls around like a roaring lion looking for someone to devour. Resist him, standing firm in the faith and the God of all grace, will himself restore you and make you strong, firm and steadfast.” The shackles of tyranny are broken represented by chains on his hand which lie broken dangling down to his left thigh and calf. With the chain under his foot showing that tyranny is under submission. There is a sword that is sheathed which means that they would defend their liberty and would not take an offensive position. Knowing the best way to keep peace is to be prepared to defend self, community and nation. 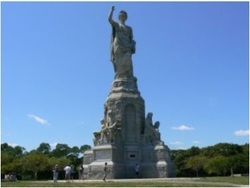 There are two statuettes beneath Liberty one which represents overcoming Tyranny the other represents Peace. The statuette representing tyranny shows a man standing with his foot on the chest of a man on the ground. The standing man has his hand raised up representing God’s strength; his foot on the chest of the other man depicts a tyrant who is kept under control which shows freedom is worth fighting for. The tyrant is trying to brace himself with his elbow to get back up which show that tyrants always will try to get back in power. The quest to gain power is innate in man. The other statuette is Peace a woman standing with an olive branch in her right hand offering peace and there is also a cornucopia which signifies abundance because with peace there is also abundance. The Forefather’s Monument represents the embodiment of why our forefather’s came to America and the values and character they possessed. Our rich Christian heritage is represented in every aspect of this historical piece of art inspiring those who gaze upon it to embrace the principles depicted on the monument. I hope this peaked your curiosity to learn more about this remarkable monument and perhaps encourage smaller replicas be made and installed all across America as a reminder of our true path.